“Homecoming” was an episode of the two-season television series “Masters of Horror” that aired on Showtime from 2005-2007. Each episode was directed by a (self-proclaimed) Master of Horror; “Homecoming” was written and directed by Joe Dante, who has directed a number of movies, most notably “The Howling,” “Innerspace,” “The ‘Burbs,” and “Gremlins.” Since each “Master of Horror” was given the absolute creative control to make their 60-minute “movie” whatever and however they pleased, I would like to write this review as an open letter directly to the writer/director himself. Let’s begin. 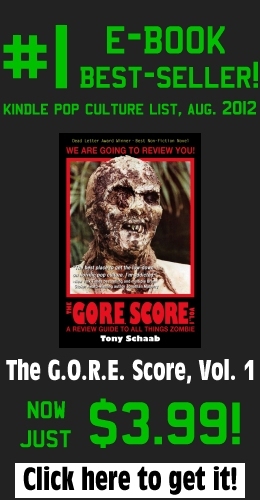 Hello, my name is Tony Schaab, and I am a zombie fan. I recently had the opportunity to watch “Homecoming,” and I must say, sir, that as a fan of the undead, I am beyond disappointed with this piece of work. It was painfully obvious to me that you wanted less a chance to tell a truly harrowing and original tale about reanimated corpses and more an opportunity to bash your viewers over their heads with your thinly-veiled political views. How do I know this? Two ways: one, I watched the episode and I have a functioning brain; two, I watched the interview with you in the Special Features of the “Homecoming” DVD where you said, point-blank, that you took the opportunity of directing an episode of this show to present your feelings on the political landscape of the time and that the zombies were simply the backdrop to showing the audience your sixty-minute opinion. Well, I would have to say (and I say it without seeing this particular show, so keep that in mind) that Romero has used zombies for political purposes, or at least to express a particular message about society as a whole, so it really comes as no surprise that this particular story came about. I think I read Death and Suffrage, or some zombie tale where the dead come back to life to vote, and then stick around. I read some review of this in perhaps Entertainment Weekly when it was on the air and they felt it was pretty heavy handed, as I recall, so I am not surprised at this reaction from you, Tony. It does sound like Mr. Dante decided to use zombies as a tool for his particular political leanings. I also haven’t seen Zombies of Mass Destruction, and have heard mixed reviews of it as another zombie tale with some very obvious political messages. It seems to me that the best zombie stories that have some sort of political message are the ones that are subtle-I think Dante could have taken some tips from Romero in this case. Great review. I LOL’d a few times the Looney Tunes reference really got me. @Patrick: you’re right, Joe Dante is definitely not the first creator to use zombies to push a political point or two. I feel that he is, however, the first person to make the political aspect of the story the primary focus instead of the zombies being the core of the story, and that’s the issue I have with “Homecoming:” it’s less about the story and more about the opinion, which is not a decent way to try and entertain an audience. More Subtle definitely would have been to his advantage in this area. @Tim: glad you enjoyed it, I had a lot of fun writing it! I still can’t believe this was Dante’s first production since he had directed the Looney Tunes movie, and he still had the audacity to call himself a “Master of Horror.” Sufferin’ succotash!